Kā iegādāties sauso suņu barību? Dažas sausās barības pielāgotas konkrētiem suņu tipiem (vidēji aktīviem vai aktīviem suņiem; suņiem ar atlētisku miesasbūvi, lieko svaru vai masīvu ķermeni; suņiem ar jutīgu ādu, gremošanas sistēmu vai alerģiskām reakcijām; sterilizētiem un kastrētiem suņiem, kā arī grūsnām kucēm). 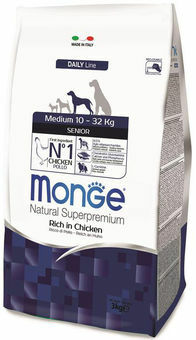 Kibbles Monge Natural Superpremium Medium Senior with Chicken are complete food for elderly dogs of medium size. They contain chondroitin, glucosamine, calcium and phosphorus that help the right joints and muscles development and L-carnitine that preserve heart and ensure an optimal weight. Composition: Chicken (fresh 10%, dehydrated 30%), rice, oatmeal (source of noble fibres), beet pulp, animal fat (chicken oil fat content 99.5%, preserved with natural antioxidants), brewer’s yeast (source of MOS and vitamin B12), hydrolysed animal proteins, potato protein concentrate, whole egg powder (rich in noble proteins), fish (dehydrated salmon), fish oil (salmon oil), hydrolysed cartilage (source of chondroitin sulphate), hydrolysed crustaceans (source of glucosamine), methylsulfonylmethane, XOS (xylo-oligosaccharides 3 g/kg), hydrolysed yeast (MOS), yucca schidigera, spirulina, pineapple stem. Analytical components: Crude protein 26.00%, Crude oils and fats 13.00%, Crude fibre 5.00%, Crude ash 6.50%, Calcium 1.20%, Phosphorus 1.00%, Omega 6 essential fatty acids 4.20%, Omega 3 essential fatty acids 0.70%, Metabolisable energy 3,870 Kcal/kg. Instructions for use: It can be used as it is or moistened with lukewarm water. Doses may vary according to the specific needs of some dogs. It is important that the dog always has fresh, clean water available. Store in a cool, dry place.